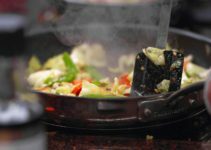 Professional quality cooking equipment is now available to anyone who wishes to invest in their ability to produce great food. One such piece of equipment is the stand mixer, and KitchenAid makes some of the best mixers you can buy. They have a wide range of mixers with different features, sizes, and attachments. Some of these mixers are simpler than others, but they still are made with the same premium manufacturing techniques as the more comprehensive professional-grade mixers. 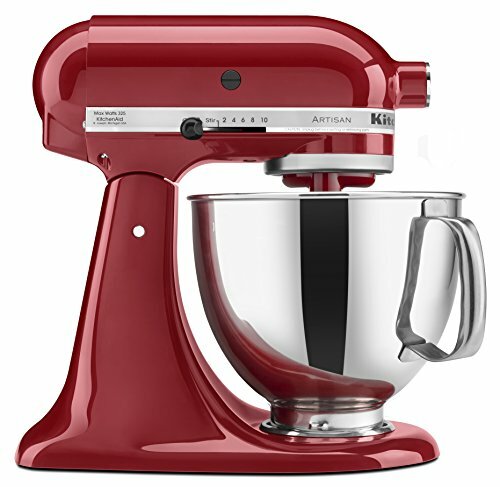 No matter what your individual culinary needs, you’ll be able to find an appropriate item from KitchenAid. 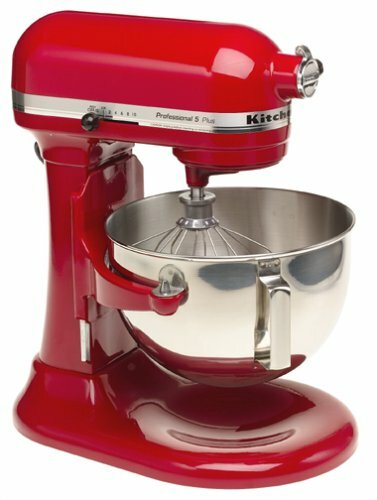 Below is a list of ten of the best stand mixers made by KitchenAid that are available today. 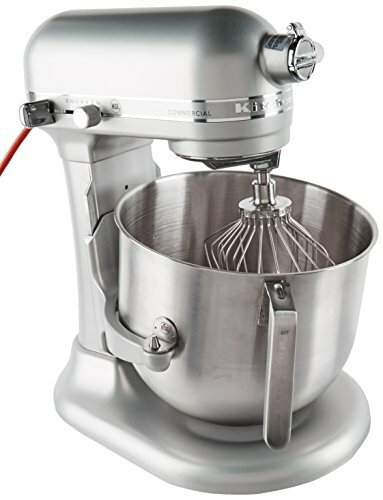 This mixer is perfect for nearly any culinary task, from whipping cream to kneading bread dough. 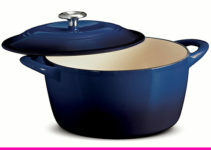 It is exceptionally powerful, and has a large 5-quart bowl made from durable and long-lasting stainless steel. The bowl has a handle for more comfortable transporting, and there are 15 optional attachments that can be added to unlock even more versatility. The head is designed to tilt back to provide an expanded access to the bowl, which makes it easier to add ingredients or change the attachment. This mixer features 59-point planetary rotation action, which guarantees maximal ingredient mixing throughout the entire bowl. It includes a coated dough hook, a 6-wire whip, a coated flat beater, and a 1-piece pouring shield. You can wash the dough hook and the flat beater in the dishwasher after use. This powerful mixer has a 450W motor that can easily mix even the thickest batches. The large 5-quart bowl allows for large batches as well, and it’s made with a durable design that uses brackets on the bowl to attach to the mixer, which provides added stability during mixing. It has a wide mixing area that negates the need to rotate the bowl during mixing, since the attachments spin through 67 different points. Such action blends the ingredients in the most efficient way possible. There are ten speeds available with this device, ranging from low to high. The unit comes with a dough hook, flat beater, and wire whip. Attachments swap on and off the mixer head with ease, and there are several optional premium attachments sold separately. This impressive mixer uses extended arms to hold the enormous bowl firmly in place. With a volume of 6 quarts, this mixer has the potential to make some of the largest batches possible with any device. 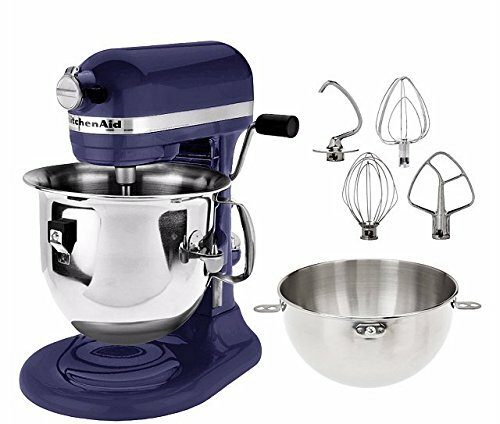 This mixer is available in over 10 brilliant colors, and it has the multipurpose attachment hub that KitchenAid mixers generally utilize. Such a hub allows for any of the 15 attachments to work seamlessly with any of these premium KitchenAid appliances. 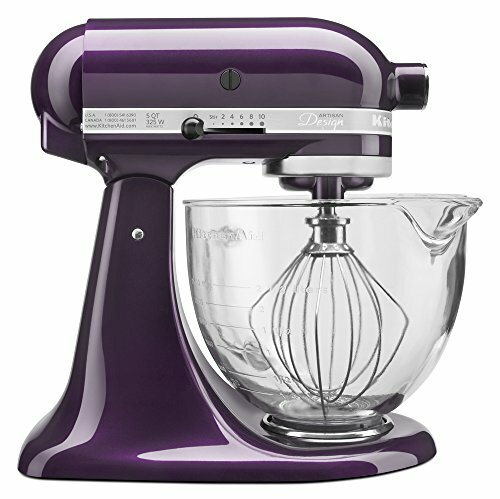 This mixer operates at 10 different speeds, ranging from low to high, and it comes with a burnished aluminum Powerknead dough hook, a burnished aluminum flat beater, a wire whip, and a pouring shield. This unit is perfect for the thickest mixtures and largest batches required. 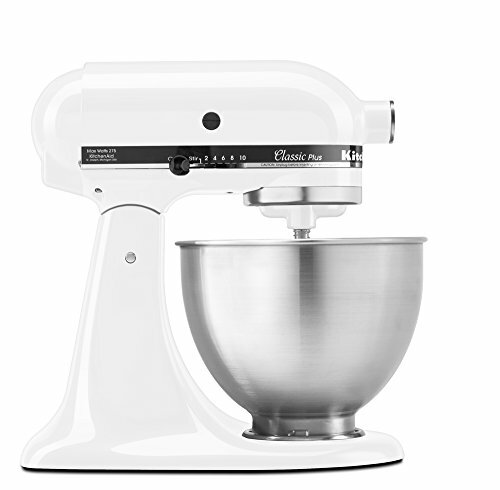 The Classic Plus mixer is one of KitchenAid’s finest standard home mixers. It has a 4.5-quart stainless steel mixing bowl, which is more than sufficient for most everyday needs. It sports the versatile multipurpose attachment hub as well, allowing for an upgrade with any of their premium attachments. The stand mixer motor works at 10 speeds, low to high, and is has a tilting head for more convenience and faster attachment changes. It comes with a coated flat beater, a wire whip, and a coated dough hook. A 1-year warranty is also included from the manufacturer, so you won’t have to worry about any hassle if there’s a problem with your mixer. This unit only comes in classic white, which fits easily into most decors. The Artisan Design series is a brilliant collaboration of form and function. It has a glass bowl with a 5-quart volume, and the bowl includes measurement markings along the side, a convenient handle for easy manipulation, and a pour spout built into the rim. The elegant glass bowl is just one of its amazing features. 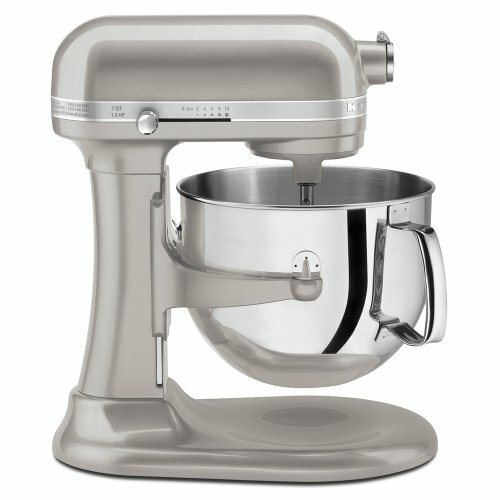 It has the same attachment hub as many KitchenAid mixers, and it includes burnished aluminum attachment pieces, like the flat beater and dough hook. It also includes a durable wire whip, and a 1-year manufacturer’s warranty that makes changing out a defective or damaged mixer a breeze. It is available in over 5 gorgeous colors and has a tilting head design for maximal utility. This mixer is most noted for its included Flex Edge beater, which reduces mixing time and clean-up time thanks to the flexible rubber edge that acts as a squeegee for the inside of the 5-quart glass bowl. 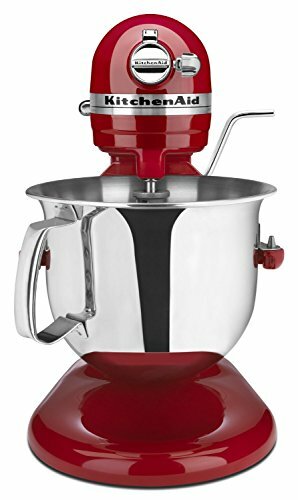 This mixer is made with many of the standard KitchenAid features, including the attachment hub, the 10 variable speed settings, and the included burnished aluminum dough hook. It also comes with a wire whip and a 1-year manufacturer’s warranty. It is available in three beautiful colors, and the glass bowl is marked with measurements for added convenience and aesthetic appeal. The mixer uses a powerful 300W motor that can blast through the toughest mixtures with relative ease, and it can be used for a plethora of other culinary endeavors if used with any of the 15 optional attachments. This incredibly powerful mixer uses a huge 575W motor to power through just about anything you can throw at it. It has a deep 6-quart bowl that provides space for batches of nearly any size, and it even comes with a second 3-quart bowl and whip for added utility. It has a Soft Start feature that helps the device maintain proper mixing right from the start, even with large batches of dry ingredients. It operates at 10 variable speeds for the ultimate in user control. It comes with a dough hook, flat beater, and wire whisk for the larger bowl. The entire unit stands 17 inches tall and 10 inches wide, so it can snugly fit on many kitchen countertops with ease. This massive mixer has one of the largest capacities available on the market. Measuring in at 7-quarts, this mixer can handle up to 16 cups of flour at once, thanks to its massive volume and powerful motor. It has a bowl-lift design for added stability, and the motor runs at ten variable speeds from low to high. The bowl is made from stainless steel and has a handle for easy transportation, which is necessary when handling a full 7-quart bowl. This model comes with a flat beater, a dough hook, and a wire whip. There is also an included pouring shield. It comes with a 5-year limited warranty from the manufacturer, and it has enough capacity to make 14 dozen cookies in a single batch. The beauty of this professional grade mixer is the shape of the included stainless steel bowl. It is contoured like a tulip blossom, with a lip that runs the extent of the rim. Its shape gives it an extra deep quality and makes adding ingredients simple and fast. The outside of the bowl is polished to a gorgeous finish, which makes it an ideal piece for the kitchen counter. It uses a powerful DC motor that operates at 1 horsepower, and it provides little or no excessive noise when in operation. This mixer is powerful enough to mix enough dough for over 8 loaves of bread in a single batch. 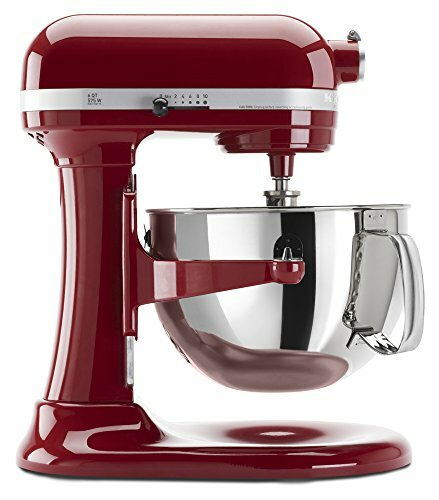 The ultimate in KitchenAid’s line of stand mixers, this series is rated for commercial use. 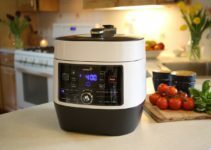 It boasts a powerful 1.3 HP DC motor, and a whopping 8-quart stainless steel bowl. The mixer uses a bowl-lift configuration to ensure proper blending, and the motor is designed to provide the most optimal amount of power for the mixture at hand. The motor never provides more than 0.44 HP to the bowl, but that is the perfect amount for consistent, dependable functionality. 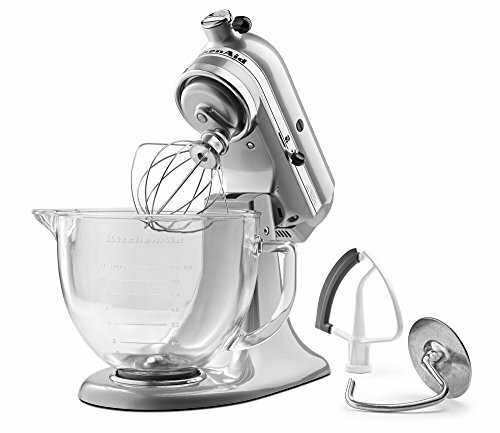 This mixer includes a spiral dough hook, flat beater, and an 11-wire stainless steel whip.